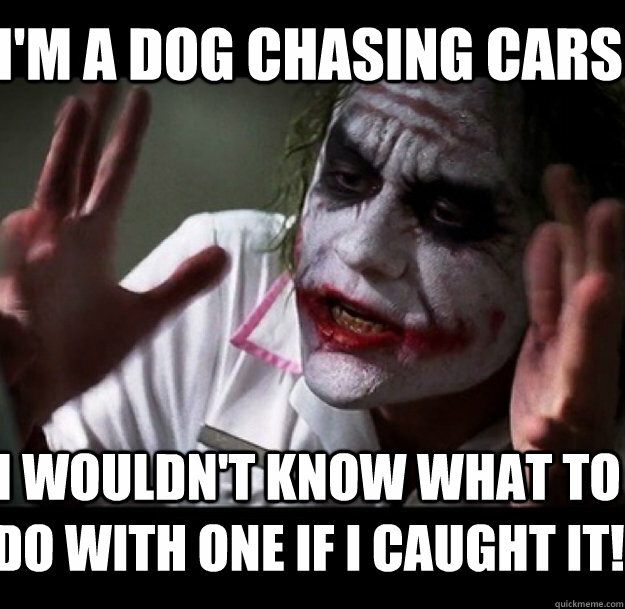 What this quote from Ledger’s legendary portrayal of Batman’s nemesis does is perfectly encapsulate the essence of chaos, and what this has in common with most of us is the pursuit of perfection, for most of us wouldn’t know what to do with it, IF we ever caught it, but continue to chase it, we must. Earlier today (thanks in part to HowToBeADad.com‘s post on Hindsight Parenting and how wise parents become when looking at our experiences in retrospect), I asked my wife what, if anything, she would advise our children someday, when the time comes for them to become parents. Her response was a brilliantly simple as it was beautifully profound. This struck a chord with me. I started reflecting back on the early days of being a dad, at which point, a truckload of negative feelings started welling up inside me. I thought back to all the mistakes I made: losing my temper because my 2-month-old wouldn’t sleep, screaming at my 2 year-old when the concluding end of my rope had been reached, failing to provide for my family when we suffered through poverty. Believe me, the list of my errors exceeds the scope of this article, but suffice it to say that I made more than my fair share of coulda, woulda, shouldas, and to this day, I still have a hard time letting go of these mistakes. Mistakes happen, so prepare yourself. Sorry to be the bearer of bad news, but not-a-one of us is going to be the perfect parent we imagine ourselves to be, so it looks like I blew my list already. It won’t matter how many books you read, classes you attend, experts you subscribe to, or practice you engage in with nieces, nephews, and random strangers’ kids. You. Will. Make. Mistakes. The sooner we all accept that, the easier those mistakes become to accept. Learn from those mistakes. Mistakes would be meaningless speed bumps in the road of life if we didn’t take a moment to look mindfully at what happened and analyze the cause-and-effect relationships leading up to them. Seriously, figure them out. Like history, those who do not, are doomed to the curse of repetition. Try not to repeat them. Once we figure out what happened, we should take steps to prevent them from recurring. Yes, I yelled at a helpless, hungry, tired baby in the middle of the night because my frustration was brimming over. What do I need to do to prevent that from happening again, because I AM human, and, given the same exact conditions, the odds are astronomically against me that I will become a repeat offender, if given the chance and no solution. Accept that, despite all our good intentions and precautions regarding steps 1 through 3 above, mistakes will still happen. The first time we make a mistake, it’s acceptable. The second time tests a hypothesis. The third time is starting to cement theory into law. Don’t go much further beyond that, but accept that, despite all our best efforts, these things CAN and DO happen. Sometimes, it’s nothing more than a character flaw that may need more work than merely analyzing cause-and-effect relationships. Some of our flaws need professional help. Seek it when necessary. I was having a particularly rough week. We’re pushing four weeks of summer break now, and the little ones are starting to claw at each others’ eyeballs. I’m at my wits’ end and tired of having to go through steps 1 through 4 at least three times a day, if not more. It was time for a new approach. I had an errand to run, so I grabbed my little guy and said, “We’re going to Petco, because we have something to return – NOW!” My evident impatience came through loud & clear, as we were quickly on our way, but with one intentional stowaway: my boy’s 3-month-old puppy, who also needed to get out of the house. For the first five miles or so, it was quiet, save for the music playing as we drove along in my old truck. The CD in the stereo was a homemade one specifically designed for spending time with my kids, as it has all of their favorites, with a few of mine peppered throughout as well. Before I knew it, arising out of the silence, a moment started happening, and it was one of those that, despite my best efforts at explaining, cannot be told – only felt. Yep, I thought, I sure am. I looked over at my little boy as we reached a stoplight, and saw the puppy on his lap, nose buried in his shoulder. He looked out his window quietly. Seeing this, I grinned a stupid, boyish grin. 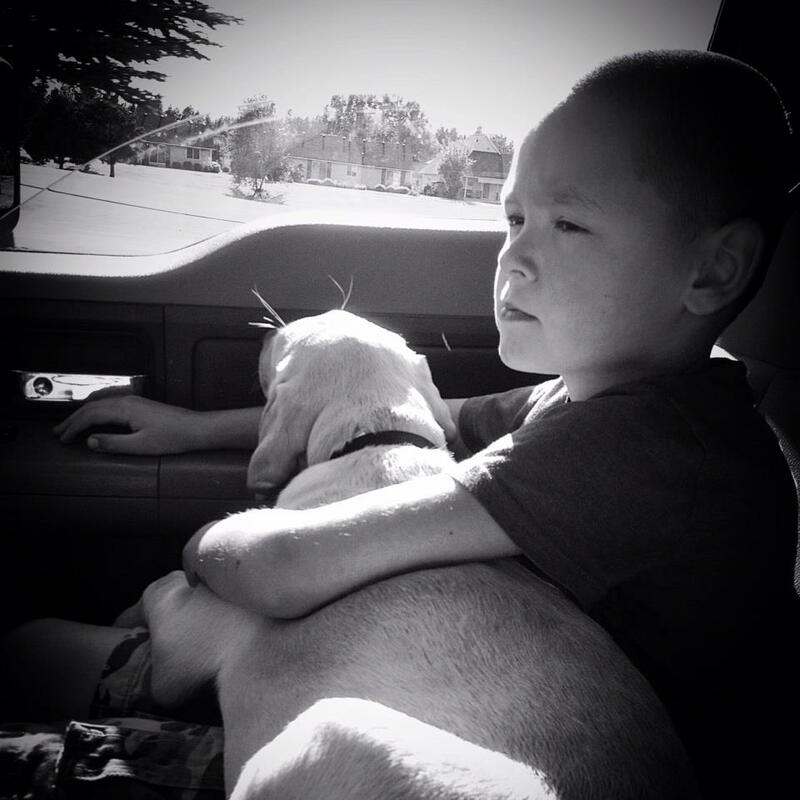 Here was my little boy with his adorable yellow lab puppy snuggling on his lap, The Eagles on the radio in my old truck. Seeing this, what the hell could I possibly be angry about? My irritation lifted just as quickly as it had arrived, much to my amazement, and I put my arm around my boy. The puppy turned around at this moment and beamed his big, brown, puppy eyes up at me as if to say, Yeah, that’s it, big guy, let go and enjoy it now, because you ain’t getting this moment back, no matter how hard you try to stage it later on! That was the moment that, like the Joker finally catching that car, I finally caught my little slice of perfection, when I realized that perfection wasn’t the absence of mistakes, but the presence of mistakes and more importantly, dealing with them the way they need to be dealt with. In that sense, we are all perfectly imperfect. So, back to the list, what is Step 5? I don’t know for sure, but it looks a little something like a 7 year-old boy and his yellow lab puppy in an old Ford truck and it sounds a little like The Eagles’ Take It Easy on a hot summer’s day. Relax. It doesn’t make sense to me, either, but I sure as hell can feel it. Wonderful post with excellent points in your list! Sometimes it takes only simple moments to realise what (and who) is really important!